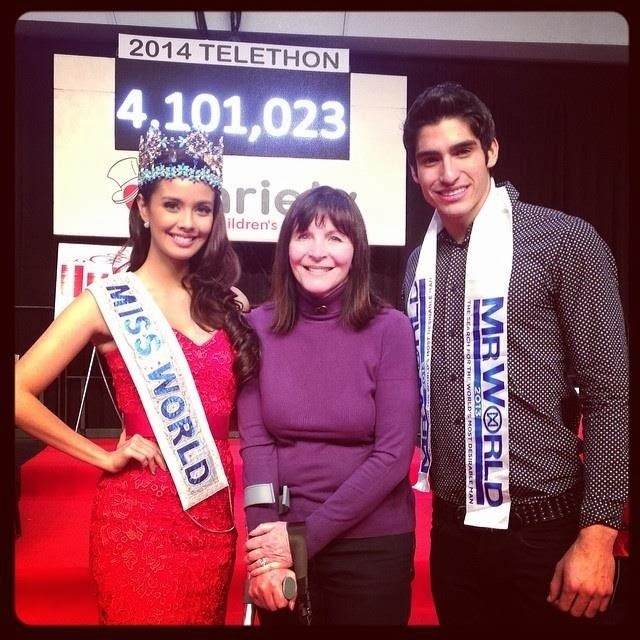 The reigning Miss World, Megan Young, took part in a 2 decade long Miss World tradition, the annual Variety Children's Charity Telethon in Iowa. This year they managed to raise over $4 million for needy children in Iowa. Young was accompanied by the reigning Mr. World, Francisco Escobar. Julia Morley also made her first appearance in almost 5 months. Mrs. Morley was seriously injured after the second floor of an orphanage collapsed in Haiti. She had to be airlifted to Florida for an emergency operation which took more than 6 hours to complete. Welcome back to Mrs. Morley! So great to see her back in action and continuing the good work!